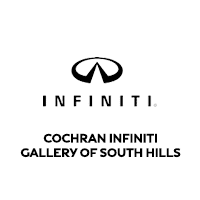 This is the second INFINITI that I have now purchased from Cochran.of South Hills. The reason I have remained a customer is their willingness to go the extra mile to help you. Their service department is the absolute best (Greg) ! And as far as the purchase of my newest vehicle I was in and out of the dealership no haggling no stress in less than and 1 hour. I advise anyone looking for a vehicle to go see these guys. Best car buying experience! Great customer service before and after purchase. Attentive, patient, sales staff who want you to be happy with your purchase and work with you to make it so! I shopped around and this place is worth a chance. Thanks Jon & Marty! Love my new truck! Will return for next purchase. Buying a new car is not usually a pleasant experience. Working with John Dunst was a quite different. He listened to what I required in a car, color, interior and accessories and found that exact car. When we got down to the price of the car and the value of my trade I feel I got a great deal. I recommend John Dunst to anyone interested in a truly positive car buying experience. Everyone complains about the car buying process...but this was totally different. Alex and Marty made the process seamless and painless. We were so pleased by the experience and have told anyone who will listen how easy and wonderful it was! I had purchased my INFINITI from a different dealership, which was a nightmare. I called Cochran Infinit to help address the recalls that were in need of service. They were extremely informative and helpful from the time I placed the call until the minute I picked my car up from their lot. I would recommend Cochran to anybody to do their business! Great job and then you for the exceptional experience!